While most people are clinched into a worldwide debate about aliens, discussing UFO sightings in space, on Earth, and the sheer number of whistleblowers who have come forward saying that we aren’t alone in the universe, the FBI has a very interesting document posted on their website. However, it is noteworthy to mention that the document itself DID NOT ORIGINATE within the FBI. The document –which is an extract from a 69-page document called ufo1.pdf— was written by a former university head. 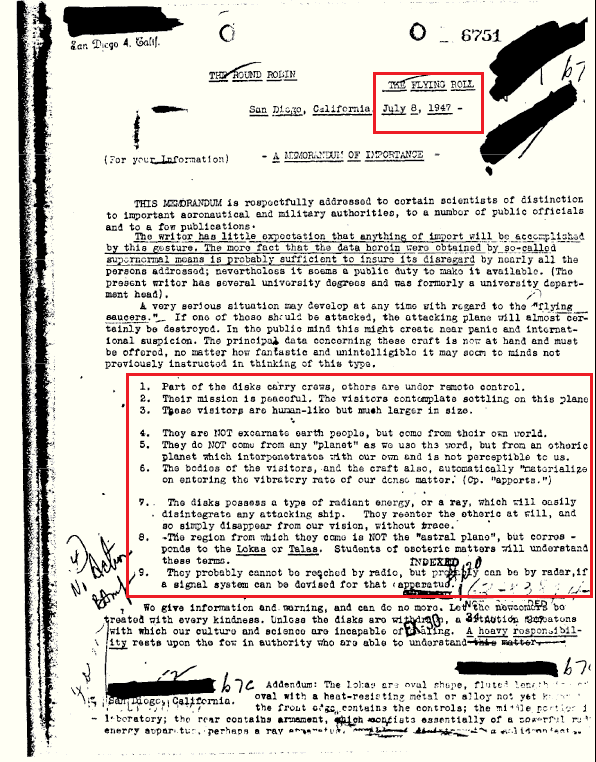 Nevertheless, the document was treated with great importance by the FBI, which is something I find VERY interesting. A rewritten copy of the report can be found below. (NOTE) some words in the original text are illegible due to the numerous notations and stamps. This memorandum is respectfully addressed to certain scientists of distinction, to important aeronautical and military authorities, to a number of public officials and to a few publications. The writer has little expectation that anything of import will be accomplished by this gesture. The mere fact that the data here-in were obtained by so-called supernormal means is probably sufficient to ensure its disregard by nearly all the persons addressed: nevertheless it seems a public duty to make it available. (The present writer has several university degrees and was formerly a university department head). A very serious situation may develop at any time with regard to the “flying saucers”. If one of these should be attacked, the attacking plane will almost certainly be destroyed. In the public mind, this might create near panic and international suspicion. The principal data concerning these craft is now at hand and must be offered, no matter how fantastic and unintelligible it may seem to minds not previously instructed in thinking of this type. Their mission is peaceful. The visitors contemplate settling on this plane. They are not excarnate Earth people but come from their own world. They do NOT come from a planet as we use the word, but from an etheric planet which interpenetrates with our own and is not perceptible to us. The bodies of the visitors, and the craft, automatically materialize on entering the vibratory rate of our dense matter. The disks possess a type of radiant energy or a ray, which will easily disintegrate any attacking ship. They reenter the etheric at will, and so simply disappear from our vision, without a trace. The region from which they come is not the “astral plane”, but corresponds to the Lokas or Talas. Students of esoteric matters will understand these terms. They probably cannot be reached by radio, but probably can be by radar. if a signal system can be devised for that apparatus. We give information and warning and can do no more. Let the newcomers be treated with every kindness. Unless the disks are with-(illegible) a (illegible, illegible) with which our culture and science are incapable of dealing. A heavy responsibility rests upon the few in authority who are able to understand this matter.